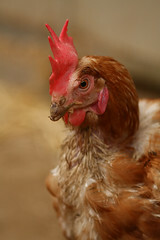 This is one of 45 hens who arrived at the sanctuary a week ago. 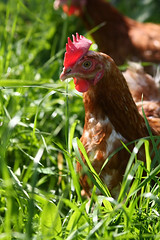 They are from a cage-free egg laying operation that had about 10,000 hens. These ladies were going to be killed at the young age of 2 (they can live another 10-15 years). They have been debeaked. The look a bit different than your traditional egg-layer. 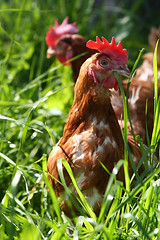 They are commercial brown layers (most are white hens called white Leghorns). Commercial brown layers are bred to be more docile with a softer temperament. They also do not produce quite so many eggs (one of the side effects of producing a lot of eggs is a high metabolism and a lot of neurotic behaviors). These are some of the sweetest hens I've ever met. They'll sit on your lap, are very curious, and some even tolerate scratches. After a quarantine, we introduced 10 of the hens to the main poultry enclosure (the others we plan on adopting out). This is the very first time they've seen sunlight and grass! They were totally overwhelmed but had a total blast. 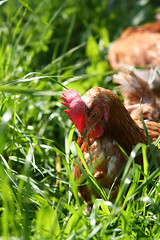 aw, i'm so glad those hens get to have sunlight and grass in their lives now! i think its horrible to deprive anyone, human or animal, of sunshine and nature. i did not know that hens can live 10-15 years! do their beaks ever grow back or are they permanently clipped?